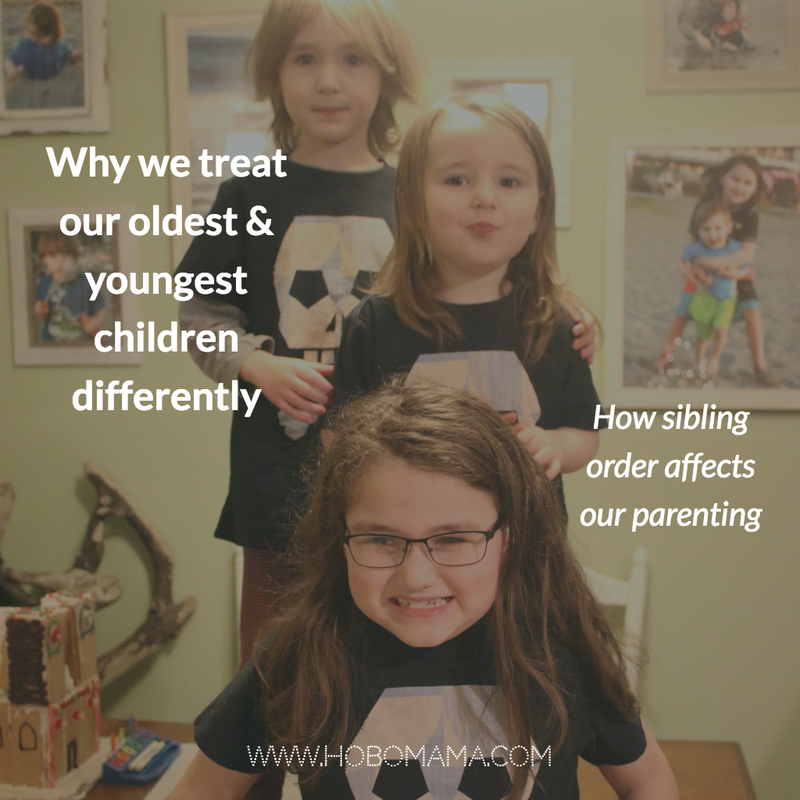 As a mother of three kids, I've had a lot of opportunity to reflect on how the truisms about sibling order come to pass seemingly by accident. For instance, I find myself expecting ever more grownup behavior from Mikko, my oldest at nine years old, and considering my youngest, now two, as still a baby. But when I look back on my days with Mikko at two, I recall thinking how grownup he was even then. Here's the explanation, and I think it's a simple one. It's not that we're callous and indifferent parents who can't let our older kids be kids and who can't have adequately high expectations for our younger ones. It just has to do with our experience of their growth. When our first child is born, it's our first child. This might not apply to those of you who extensively nannied or babysat or co-raised siblings before parenting, but for the rest of us, we're experiencing each milestone as the first time it's happened. When our firstborns smile, Whoa! Before they'd just gurgle and poop! Now they're social. When they sit up, Holy motor control! When they stand and talk and wave, everything's an obvious big leap forward, bringing them ever more distant from the last stage they were at. When our subsequent children are born and make those same leaps, we remember our first child's leaps and see both how far these new children have come and yet, comparing them to the first children, how far they have yet to go. Like, sure, they're using a potty every once in awhile, and bully for them, but the oldest knows how to do times tables. Meanwhile, our oldest children are the oldest we've ever experienced in parenting. Where they're at is the pinnacle of growth we've personally witnessed, and everything they do is that many more times competent than whatever their younger siblings can accomplish. Even when they're just two or three, that's the oldest and wisest we've ever seen a child be up close, and all we have to compare it to at that point is the earlier days with them. I'll find myself looking at photos of Mikko and remembering how grownup he seemed — and then realize that he's the same age in that photo as Karsten is now, and I do not think of Karsten as grownup in the least! So we're looking at our littler children and thinking, They still have so far to go! They're really just babies still, considering how far it will be before they're big and strong like their older sibs. I'll let them just be coddled a bit longer. And we're looking at our oldest children thinking, You're the most independent and competent of any child here, so you're clearly ready for ever more responsibility. Let's get you voting and driving and ready to go to college! It's not wrong of our brains to trick us like this. It's natural and not our fault that we can't always see past it. We don't need to beat ourselves up for being human as we parent. What keeps me centered is my aptly positioned middle child, Alrik, who at five sets up a daily, vocal reminder about being in that tough spot between competence and neediness. He decries favoritism toward either brother, so he keeps me honest when I need it. 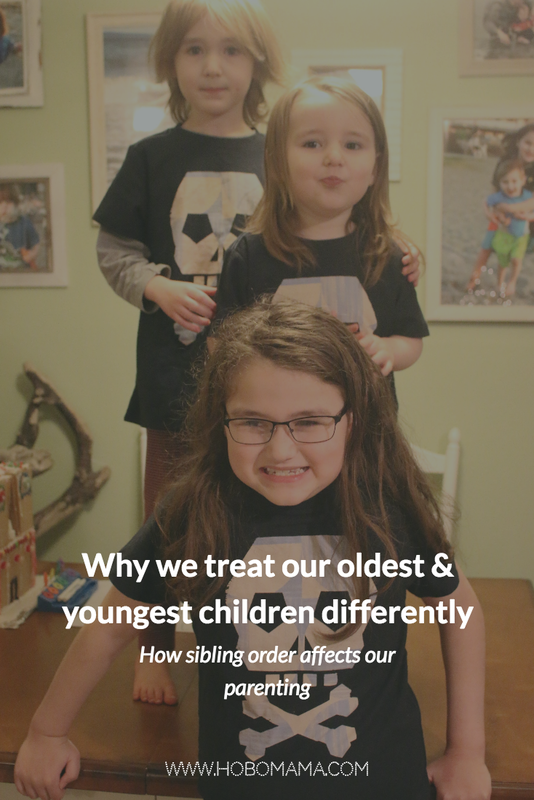 What's your experience with sibling order and how it affects your parenting? How did it affect you growing up with or without siblings? How is it with only children — do they always seem adult or always seem like the baby? Share, share! Hm. I don't know if I do the "increased responsibilities" thing, although I know all about that as the eldest in my family. BUT, I think I do the thing where I worry more about my eldest, while shrugging and saying "she's completely fine!" about my younger. There are a lot of reasons for that, many completely legit and related to the personalities and quirks of my kids, but there's also just the habit of worrying, which is hard to shake. @Inder-ific: I do increased responsibility in the sense of asking Mikko to keep an eye on the youngers, not so much with chores and such (because we're all complete slackers there, heh). It's much easier to go on errands if he's along, for example, because he can stay with our stuff while I take the little kids to the restroom. I feel like I might not consider Alrik ready for responsibilities like that at the same age I considered Mikko ready, but we'll see. I know I let Mikko stay outside of a restroom before other adults were ready for it, because I had some concerned employees confront me afterwards a couple times. Agreed about the worrying, too. I think we both have … unique? … firstborns, so that's part of it, but it does become easier with the subsequent kid(s) to say, Eh, they're all different.